Conservative Senator Patrick Brazeau had his hair cut in the foyer of the House of Commons today for losing his weekend charity boxing match with Liberal MP Justin Trudeau. Conservative Senator Patrick Brazeau had his long hair chopped off in the foyer of the House of Commons today after losing his boxing match bet with Liberal MP Justin Trudeau on the weekend. Brazeau was also presented with a Liberal hockey jersey as part of the bet he and Trudeau made before Saturday night's bout at an Ottawa hotel. Brazeau must wear the red shirt, which says Trudeau on the back with a No. 1, all week. 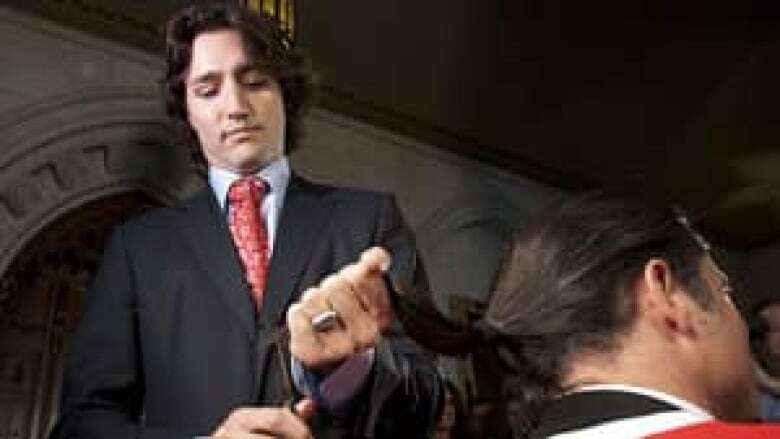 Trudeau trimmed only a little of Brazeau's ponytail as he sat in a barber's chair in the foyer, but Brazeau insisted he wanted more cut off because he wanted to fully honour the bet and his mother. Brazeau said he grew his hair long after his mother died in 2004 and in 2010 he cut about a foot off of his locks. His father has been urging him to cut it even shorter and Brazeau said he will be happy with the trim he got Monday. The boxing match on Saturday was a fundraiser for cancer research and $230,000 was raised. Trudeau lost his father, former prime minister Pierre Trudeau, to prostate cancer, while Brazeau's mother died of lung cancer. Trudeau refused to cut off Brazeau's ponytail and left the task to a hairstylist. "It stings. I'm a proud Conservative aboriginal person, I've always been a person of principle and I'm a proud Conservative, but a bet is a bet, and I'm a man of my word, and I said I would do it and I lost," said Brazeau. "Life goes on. I'll live." "There was a lot of pressure on my shoulders to see Justin knocked out from a lot of Canadians," he said. "I did the rookie mistake of coming out way too strong. In retrospect perhaps I shouldn't have done that, but I did it and that's what led to my defeat. "I made some mistakes and I'm going to pay the price for it today and all week," said Brazeau. He wants to take Trudeau on again at next year's Fight for the Cure event but Trudeau is declining the invitation. This match was at Trudeau's request because he has taken boxing lessons for years and wanted to get in the ring for a competitive fight. He's not interested in doing it again. "I got to check off the little box on my bucket list that said, 'Get in a real fight, participate in a boxing match.' I'm a parliamentarian, not a boxer," he said. "I was glad to raise as much money as we did but I will not be in any boxing matches anymore, I've got work to do."